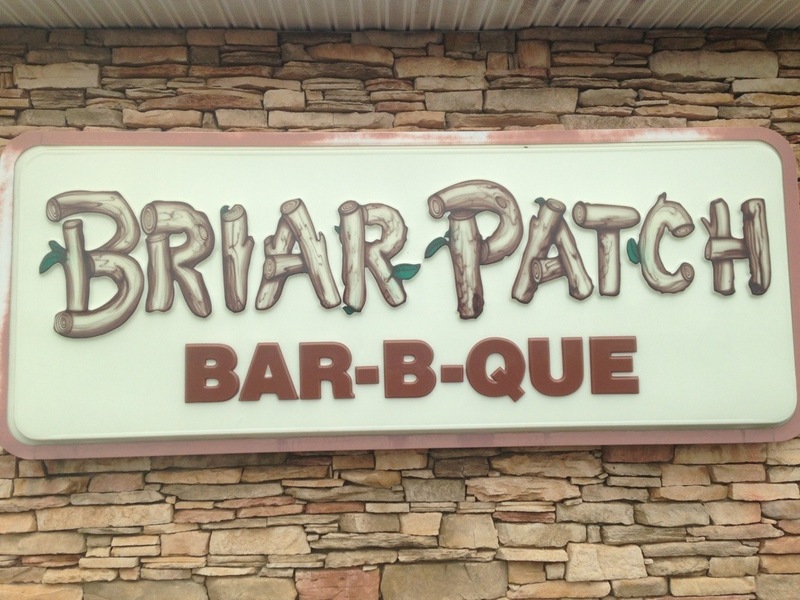 Briar Patch is, by proximity, our neighborhood barbecue place, although I haven’t eaten there in six or eight years. I went in this afternoon, well after the lunch rush, to pick up some carry out. The menus are TV screens on the wall and differ slightly between carry out and dine in (one had a pork chop in place of chicken wings, for example), but either way, you queue up, order and take a seat. Or find a spot to wait, as I did. I found a clean table in the room to the right of the registers (where the above picture was taken) and took a seat while I waited. 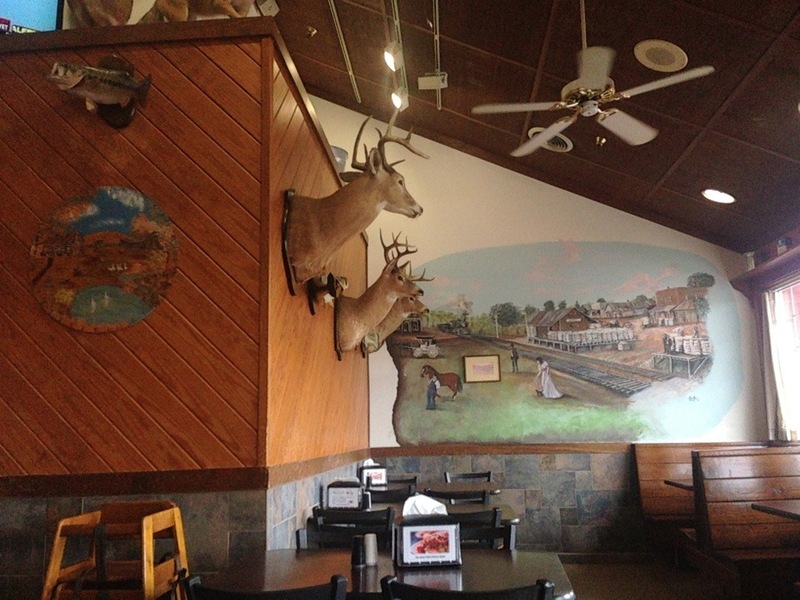 I can think, easily, of a half dozen BBQ places with animal heads on the wall and there were plenty of deer, fish and a couple of foxes here. But you know what’s always missing? Pigs, cows and chickens. I ordered a pork plate, with fries and stew and a “hickory tater” with chicken. I went roaming, checking out my sauce options and found three squeeze bottles on trays. 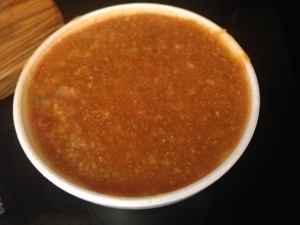 I couldn’t find any containers for the sauce, so I asked at the window where I picked up the food what the sauces were. The manager told me that they only had one sauce and the other two were ketchup and their hot mustard sauce. I asked for a couple of containers of the hot mustard to go. The issues with today’s barbecue were twofold. 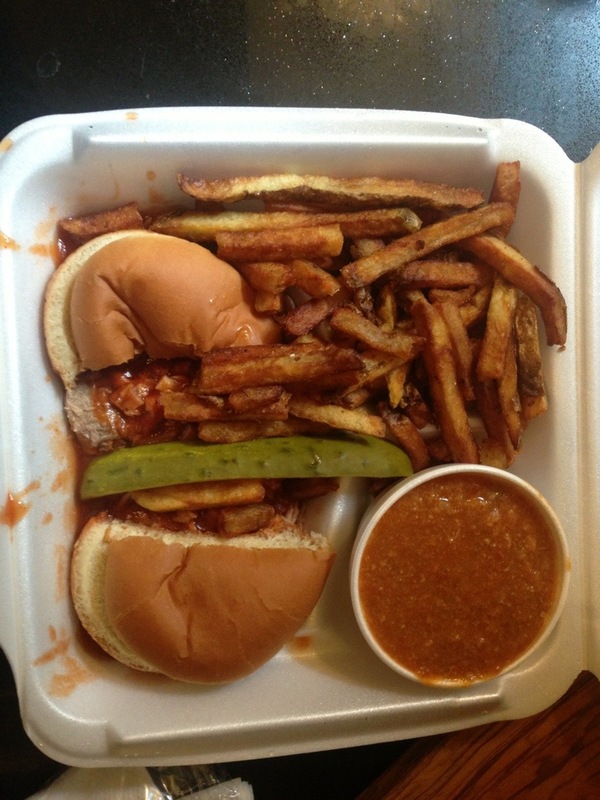 The first was the pickle – there was a pickle slap dab in the middle of the carry out container leaving its gross juice on the barbecue, fries and bread. On to the hickory tater. 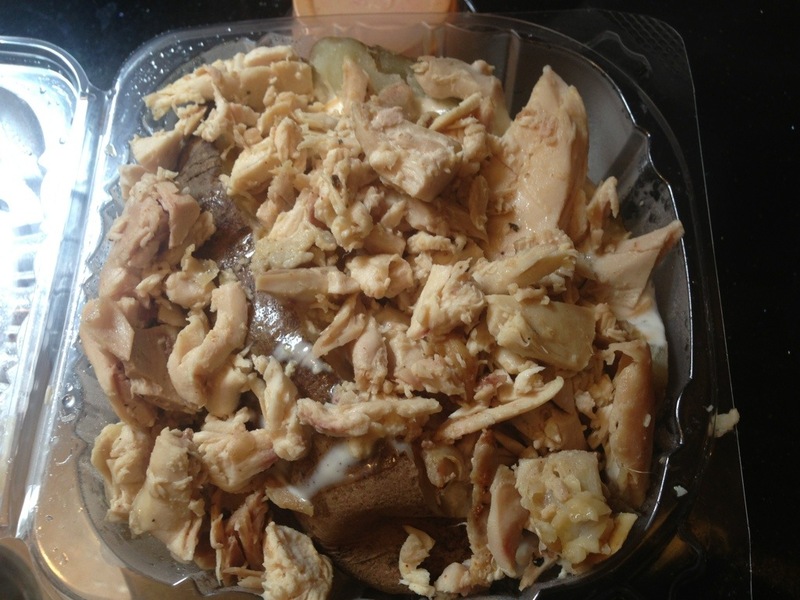 I asked for barbecue chicken and it came with grilled chicken instead, and no sauce whatsoever. The good news is that, according to the diner, the potato tasted much better than it looked. Which, when you look at that picture, wouldn’t take much. Overall, the meal was a disappointment. We may try it again, in less that six years, and eat in. It would almost have to be better.